is professor of experimental architecture at Newcastle University in the UK. She is the author of Star Ark (2017), Vibrant Architecture (2015) and Living Architecture (2012). Traditional buildings are designed to provide protection against a savage world, with us safe on one side and our waste on the other. Architects have long relied on ‘hard’ materials such as masonry, aluminium and glass, specifically chosen to prevent the outside environment from getting in. Impermeability was, and is, a driving goal. It is time to rethink that approach. Our current built environment squanders too much fresh water and other vital resources, and tips too many poisonous substances into our surroundings. To develop a more sustainable relationship with the natural world, we need to allow chemical exchanges that take place within our living spaces, and between the inside and the outside. We need to embrace permeability. Until the rise of modernity, a certain amount of the outside world always leaked into our living spaces, entering through crumbling brickwork, broken seals and open windows and doors. However, with the rapid growth of industrial cities in the mid-19th century, pollution, overcrowding and disease posed new external threats. The remedy was to exert tighter control over our habitats, with the result that buildings became true barriers. Today’s building ‘envelopes’ seal off our living and working spaces to a degree previously unencountered. In many offices, it is no longer possible to open windows manually to let in a breeze. Automated air-conditioning systems (often answering only to sensors and software) blast summer heat out into scorching walkways, amplifying the urban heat-island effect and contributing to heat-related health risks. Such buildings ignore the metabolism that is the dynamic scaffolding of living systems. During the 1970s, the ecologists John and Nancy Jack Todd and William McLarney founded the New Alchemy Institute – now the Green Center on Cape Cod in Massachusetts – to reconceive building spaces as part of a self-sustaining human ecosystem. Such spaces would not be hermetically sealed, but rather open to the flow of natural elements. The research institute experimented with integrating a range of sustainable systems, such as solar power, organic agriculture, aquaculture and bio-shelter design, which went hand in hand with the permeability of these living spaces. Their results pointed a promising way forward. Incorporating permeability into architecture begins with a building’s composition. In the past 20 years, engineers have developed organic construction materials that have various degrees of permeability. Mycotecture – architectural building blocks that are formed from the fibrous material of fungal roots – are as strong as concrete and as insulating as fibreglass. BioMASON bricks are built by microorganisms; they do not need firing and are as strong as traditional masonry. Bioplastics are produced by bacteria using biogas from landfills and wastewater treatment plants. Since they are not derived from petroleum, bioplastics have lower carbon footprints. Like wood, they are ‘farmed’ into existence. Riddled with spaces, these ‘soft’ materials allow a whole different set of geometries, structural properties and effects than are possible with traditional construction. David Benjamin’s Hy-Fi tower, constructed from mycelium (mushroom) bricks, offers a hint of the vast potentials. Yet even when modern builders use the new organic materials, they generally treat them so that they present ‘hard’ interfaces to the environment. Fully embracing permeability opens up broad ecological and environmental possibilities. Semi-permeable ceramics in particular can be treated to provide binding surfaces for biofilms, large coordinated colonies of bacteria or other microorganisms. Biofilms can be grown to have semiconductor properties, akin to solar cells or computer circuits. When treated with manganese, biofilms can become filters that regulate the flow of air and water into a building. Builders are starting to explore the possibilities of strategically placing ‘hard’ and ‘soft’ interfaces within a structure to regulate the delivery of resources and organic responses to these inputs. 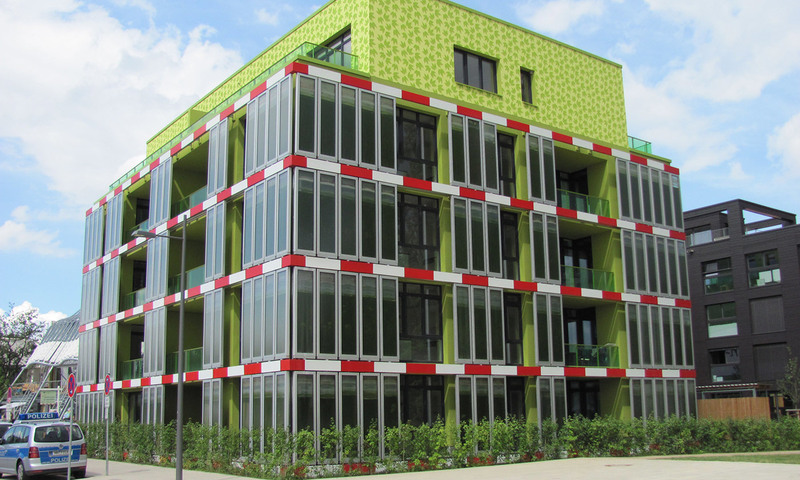 For example, the BIQ House in Hamburg has a façade of thin-walled tanks filled with microalgae. The algae harvest sunlight and carbon dioxide, and produce biomass that can be used to generate electricity. The translucent, living tanks also regulate the building temperature by absorbing more sunshine as the biomass increases. In this case, the glass of the tanks is impermeable to water but lets in sunlight – a different kind of permeability, which is critical for the organic exchanges within the façade. The Living Architecture (LIAR) project, funded by the European Union among others, is a fruitful effort to create showcases of semi-permeable design. For instance, the project aims to transform bathrooms, kitchens and commercial spaces into environmentally sensitive, productive sites. Wall sections in the rooms are replaced with bioreactors, self-contained microbial systems. One type of bioreactor is a fuel cell that houses anaerobic bacteria to produce electricity and clean water. Another is an algae photobioreactor that produces biomass for fuel or food. The third type is a synthetic bioreactor that can make alcohol or other plant-based materials. Bioreactor walls are strong enough that they can form interior partitions, but they are also active, functional parts of life inside the building. They can recycle detergents from domestic wastewater, produce fertilisers for the garden, and synthesise new, biodegradable detergents – just from grey water, carbon dioxide and sunlight. Future bioreactors could also generate bioluminescent lighting, produce nutrient-rich food supplements, and remove problematic oestrogen-mimic compounds such as polychlorinated biphenyls (PCBs) from drinking water. In commercial spaces, living walls could recycle water, fertilise green roofs, and purify air to make building interiors healthier and more like natural environments. The LIAR project is still in a prototype phase. Quantitative inputs and outputs have not yet been formally established. But project leaders expect to see integrated bioreactor wall systems in real homes within the next 10 years. Hard, inert interfaces are unlikely to become obsolete any time soon. The real impact of living architecture will be to introduce a new palette of structural and functional systems that change how we think about sustainability and resource management within the built environment. In particular, the LIAR project raises the possibility of a new, active relationship with natural processes. We could develop new ways to speak with the living world physically, biologically, mechanically and even electrically. Breaking down the barrier between inside and outside will allow us to choreograph a flow of vital resources such as water and minerals. The end result will be a kind of artificial metabolism for our homes, commercial spaces and cities – a long-overdue realisation of a more ethical and symbiotic relationship between the built and the natural worlds.